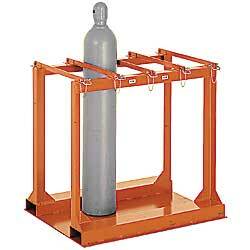 Fork liftable pallets handle 4, 6, or 8 cylinders up to 9" in diameter. Double-welded steel construction. 7-ga. steel pockets on both ends accept forks up to 6-1/4" wide. 34"W x 40"H overall. Depth varies from 23" to 43". Hinged dividers provide easy access to each cylinder from either end. Orange enamel finish. FACTORY QUICK SHIPFOB NEBRASKA. ZC-349 153	 4	 4	 34" x 23" x 40"
ZC-350 200	 6	 6	 34" x 33" x 40"
ZC-351 247	 8	 8	 34" x 43" x 40"